No long preamble this week. 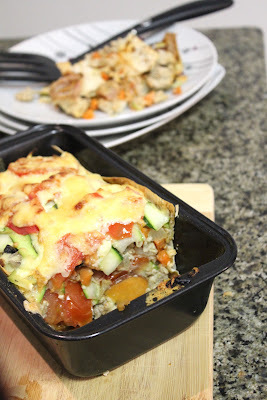 Just quickly - if you were here last week and liked the look of my clean lasagne, check it out here. The link is again at the bottom of this post, as by pure luck, I happenned to make it on the day I was taking pictures for WIAW. So yay for two weeks with lasagne pics. So, as usual, a huge thanks to Jenn at Peas and Crayons for hosting this party. And now I will show you Sunday's food! Breakfast: These amazing pancakes - banana chocolate protein pancakes with chocolate chips. Yes, they will be on the blog. Once I learn how to flip pancakes. I am the world's worst pancake flipper. So the recipe has been perfected, after a few awful attempts, but the flipping needs practice. I don't want to give you awful pictures of mush on a plate. Lunch: Leftover whole wheat pasta with every vegetable imaginable and homemade sweet potato chips. Dinner: Lasagne. Recipe here. Again, I'm sorry about picturing this twice in WIAW. Dessert, unpictured: One tin of weight watchers 'two fruits' with cornflakes. Unpictured snacks throughout the day: Popcorn. A lot of it. And some brownie batter. Ok, maybe more than some. Snack, pictured: Frozen yoghurt bites. Recipe coming soon. These were pretty much demolished by roommates when I wasn't looking (that's right guys, I know how many are left now). I love those frozen yogurt bites, I am not going to lie though, I have yet to make them because I am too damn inpatient and can't let the yogurt freeze. Not to worry, I'm not the best pancake flipper either ;) But ooh do pancakes sound fabulous right about now! I know. Thinking about them now makes me want them so bad! I want those frozen yoghurt bites! Your food looks awesome!! Sometimes when I make healthy pancakes (aka 1 banana + 1 egg) I have to cook it looooow and slooooow for a long time to get it to not crumble. I can't wait to see this recipe once you perfect it! I low the simple banana and egg pancakes. They're amazing :) I have to cook those for ages as well! Those frozen yogurt treats look awesome! I love yogurt in every form, especially ice cold ;) (I think I feature yogurt on every WIAW at least once.. lol) Happy (WIA)Wednesday! The frozen yogurt bites and the pancakes look great! Can't wait for the recipe! I'm always attempting to make my pancakes just a little healthier!